On Saturday August 8th, Voice Coaches welcomed the X Squad to White Lake New York. The X Squad is an exhibition water skiing show team comprised of elementary, middle, high school, and college students. To ski on the team, members must maintain a positive grade average in school, and demonstrate positive behavior and responsibility. 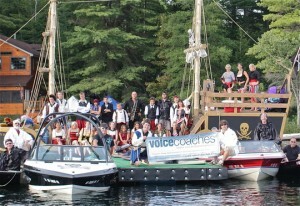 This year, the team showed off an all pirate theme, complete with their new 40 foot pirate ship. Barefooting, doubles, kneeboarding, and pyramid formations were all part of the show. Perhaps the audience favorite however, was the four member X Squad jump Team. The four performed a set of increasingly challenging jumps that led to the teams final three-level pyramid. Everyone at Voice Coaches is delighted to support this tremendous group and we look forward to seeing the whole gang next year! Arrrrrrr! ← Need a Job? Speak up!